This 48.5 kilometre coastal hiking trail follows the rocky shoreline of Lake Superior and affords many spectacular views over the Lake. Rock hopping is the order of the day when hiking this trail! 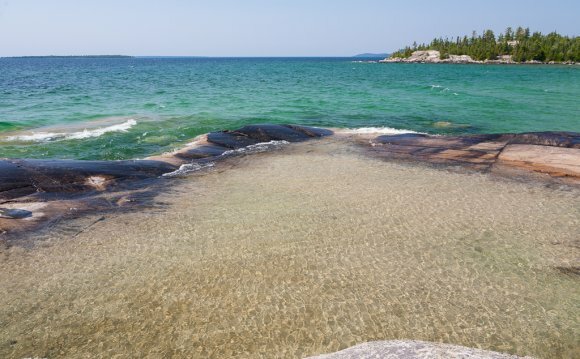 Big rocks, little rocks, and medium rocks with a few beautiful white sand beaches thrown in at the mouths of the rivers! When they warn you not to hike if the rocks are wet, they MEAN IT-listen carefully! Gargantua Harbour to Warp Bay-mostly gentle ups and downs to a lovely sand beach. Sand River to Katherine Cove-mostly sand beach with only one short headland to cross. Agawa Pictographs or Sinclair Cove to Agawa River! About 15 minutes south of the pictographs you have to squeeze between or under slabs of rock that weigh tons, and hike along very narrow paths at the top, or clinging to, the sides of sheer rock cliffs above Lake Superior. Not for the faint-hearted! Hiked this trail? Comment in the to let others know about it. Check with the Park Office near Rabbit Blanket Campground or the Visitor Centre in the Agawa Bay campground.